By Dee Horne. Peter Lang, Inc. December, 2018. 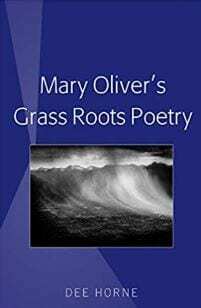 Mary Oliver’s Grass Roots Poetry examines the poetry and essays of Pulitzer Prize winner Mary Oliver. Her writing offers an environmental ethics that is relevant to readers interested not only in poetry but also environmental writing. She neither replicates hierarchical relationships nor romanticizes nature. In situating all as kin while also respecting differences, Oliver creates a grassroots poetics and an environmental ethics that invite readers to rethink our responsibilities and how we interact with others, human and nonhuman, animate and inanimate. Respectful coexistence with differences is necessary for the survival of all.